If you’ve ever had any problems trying to sit quietly and meditate by yourself, then perhaps it’s worth considering meditating with your dog. I have three dogs and I have learned how to meditate deeply and peacefully with all of them at the same time. Here’s how it works. Dogs are creatures of habits, much like we are, so I make sure that when I meditate it’s always at the same time of day. As I like to meditate first thing in the morning, I make sure to let my dogs run around in the backyard with me before we settle down to meditate. After about 5 to 10 minutes of playtime, then I bring their beds into my meditation room and get them to settle down into them. Part of the process of helping them to meditate is to make it easy for them to understand what is required of them. In this case, the cue that they are conditioned by is the command to lay down in their bed. Once that happens, then the next phase happens almost automatically. Dogs are highly receptive to the energy that is going on around them, so as I sit down and prepare to meditate I make sure to keep my energy calm and relaxed. Then, I put on some meditation music that I know my dogs are used to hearing and relaxing to during meditation. I’ve also played around with meditating with them in the afternoon and the process works just as effectively, as long as the time of day and type of meditation stays fairly consistent. So if morning meditation doesn’t work for you and your dog, then the afternoon or evenings will work just fine. It doesn’t really matter what meditation music you use as long as it’s not too loud and it seems to help them relax while they are meditating with you. I have found some really good meditation audios of crystal bowls and even ocean waves that seem to do a really good job of helping them to relax completely. 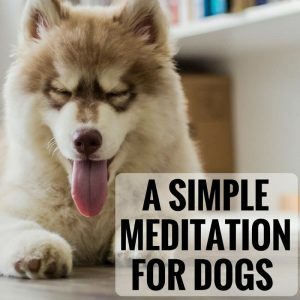 When you first start meditating with your dog don’t be too concerned if they are a bit nervous or fidgety at first as it may take awhile before they get into the habit of settling down at meditation time. This is to be expected as we are exactly the same. It takes us awhile before our mind lets go enough for us to meditate on command. I must say though that meditating with my dogs is one of the most rewarding things I do each day. Not only is it a great way to bond with them and spend time with them in a calm and caring way, it’s also good for their overall health and well-being. At the end of each meditation session with my dogs, I like to be playful with them so that they associate the entire meditation experience as something fun and pleasurable. There’s plenty of tail wagging and licking of faces during this time. It may not always be appropriate to meditate with your dog due to circumstances that make it difficult or challenging but if you can create the time and space then it’s a win-win for you and your dog. Just like meditation helps you to de-stress and enjoy some peace of mind, it also helps your dog to be less anxious and more relaxed. If at any time during your meditation your dog decides to get off their bed or wants to run around, then calmly lead them back to their bed and help them to settle down again. You may need to repeat this a few times at first before they get it but stick to your guns as repetition is the key. Use whatever arises during the meditation as part of your meditation experience rather than letting it upset you or make you feel like you are not meditating properly. Anything can be a meditation – it just depends on your focus. As long as what you do is done mindfully and calmly, then it will retain an element of meditativeness to it. Helping your dog to enjoy more calm time during the day can only benefit you and your dog. A lot of the issues that dog owners can face with their dogs like chewing furniture, excessive barking, or even aggressive behavior, can be attributed to your dog having too much nervous or anxious energy. While exercise can and does help with this, so too can meditating with your dog.